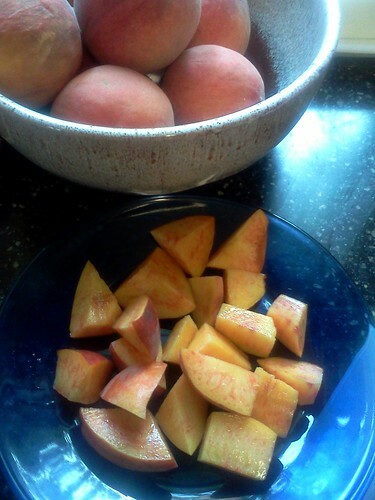 I went a little overboard in quantity the other day when I bought some peaches from the OSU-OKC Farmers Market. My shopping list included only three things: okra, tomatoes, and fruit. It didn’t matter what kind of fruit because I am not familiar with Oklahoma’s seasonal stuff yet, I just wanted something fresh and local. The first vendor I saw when I walked into the pavilion was selling peaches and there was a line of people waiting to get their hands on some. That’s always a good sign. So I waited my turn, handed over my cash, and came home with a basketful of peaches. 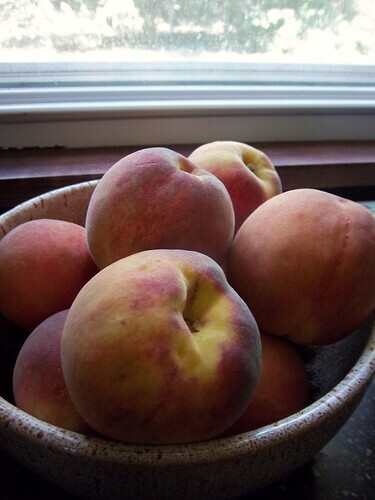 Because of my deep loyalty to the South (some the first things I made when I got to Oklahoma were a gallon of sweet tea and a key lime pie), I publicly declared on Facebook that no other peach could possibly be better than a Georgia peach, although South Carolina peaches are pretty darn tasty, too. This didn’t necessarily cause an uproar but my husband called me out, and rightfully so. I’ll admit it – I hadn’t even put a bite of an Oklahoma peach in my mouth yet before I’d downgraded it to some kind of substandard replacement for the real thing from Georgia. 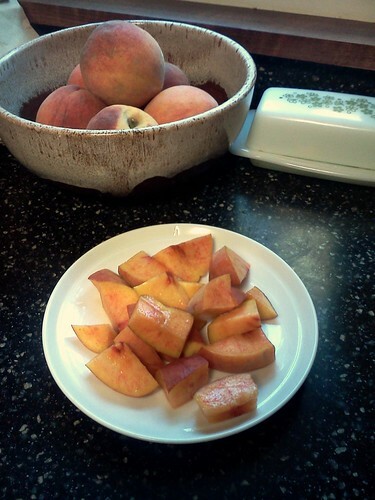 And here is where I make my public apology, because these Oklahoma peaches are freakin’ delicious! I have eaten at least one each day since Sunday, mostly for breakfast but sometimes for dessert. Sadly, I don’t think they’re being eaten quickly enough because a few of them are becoming wrinkly and squishier than they should be, but I’m doing my best! Some people might say, why don’t you can them? And I have two reasons for why I am saying no. I’m too lazy to learn and, quite frankly, I don’t want to. Why save for later what you can EAT RIGHT NOW!!!??? Surprisingly, I am not yet sick of eating peaches. I am, however, sick of this song playing over and over and over in my head, though. Does this little ditty pop into your head every time you hear the word peaches? Damn you, 1995. This entry was posted in community, farmers' markets, food, music, Oklahoma, Oklahoma City and tagged Farmers Market, food, Oklahoma, Oklahoma City, peaches, POTUSA. Bookmark the permalink. Good, because I have a feeling we’re becoming friends. Had never heard the little ditty. Liked it. And I apologize now for any replays it may have in your brain in the future.